Good morning and happy July! How was your weekend? Mine was absolutely jam-packed, but very good (see my week in review tomorrow 😉 ). I have to say, I am so looking forward to the four-day weekend I have coming up…I’ll get to cook, sleep, lounge, play with Ella, blog, and do all of the other things I have had next to no time to do lately. Another great thing about this four-day weekend? It’s brought on by a holiday: Independence Day! This year is going to be pretty low key for me, but in the past, I’ve spent the 4th of July watching fireworks at places around our house, in Boston, in D.C., and sometimes just on the couch at home. That said, I’m not going to any fun holiday picnics this year, but I have a feeling many of you might be. So, I want to share one of my all-time favorite recipes with you. It would be perfect to bring along to that picnic of yours, or to simply make as a Meat Free Monday side dish. Either way, I hope you give it a try! Fill a large pot with cold water and cubed potatoes. Bring to a boil. Cook until the potatoes are fork-tender, or 10-15 minutes. Drain when ready, and allow to cool to room temperature. Meanwhile, chop the bell pepper and scallions. Set aside. In a small bowl, whisk together the vinegar and oil. Whisk in mustard and yogurt. Season with salt and pepper to taste. 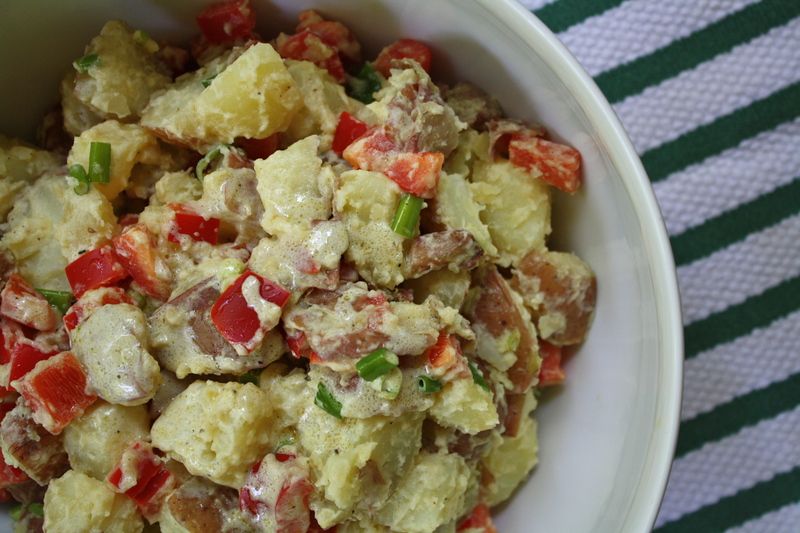 Combine cooked potatoes, bell pepper, and scallions in a large bowl. (Add bacon, if you’re using it.) Pour dressing over everything, and toss. Serve at room temperature or cold, and enjoy! this sounds delicious, especially for the heat that keeps coming our way! Exactly – the less the oven has to be on, the better! Wow. This seems so simple to make! I never knew that you used vinegar in potato salad. I also never considered that we can’t have mayonnaise because of the eggs 😦 Have you ever tried vegenaise? Just curious. The idea always kind of creeped me out. Lol. I haven’t tried veganaise – I actually haven’t ever given it a thought! But I’m with you, it does sound a bit…odd. DROOL. Omg this looks amazing. Thanks! It is. And much healthier than mayo! So I may or may not be slightly upset with you for not posting this recipe yesterday… I could have used it to bring to the BBQ I went to this weekend 😛 But it looks delicious and I’m SO keeping it in mind for next time. I’ll have to try this! Looks good. Thanks! Please let me know what you think! Yum I love potato salad! This sounds great! 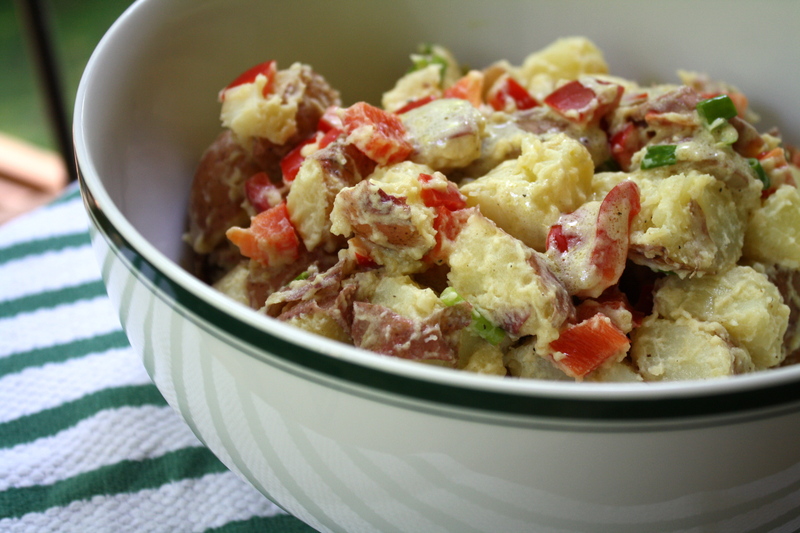 I never would have thought to use Greek yogurt instead of mayo in potato salad, but I think it would be super tasty! My family has plans every year on the 4th of July weekend- a volleyball tournament & party with longtime friends of the family 🙂 So I’m kind of excited to be going away on Friday! Oh that sounds like a great time! I hope you have fun! I majorly dislike mayo so this sounds delicious! Oh yeah, it’s absolutely the time of year for this salad, it’s worth planning a picnic around! I think we will get to the fireworks this year, I’m really looking forward to the long weekend too! Well this looks really good, and I even like the additional of bacon, even though I will have to force myself to omit it. Bacon was one of the few meats I actually enjoyed back in my carnivorous days. I was actually a card carrying member of the bacon of them month club once. Aw, I’m sorry. Bacon really is so good, but I’ve tried this salad both ways (using it and not), and I actually like the way it turns out better without it!